It has been a while since I have taken a pill for anything. I listen to my body and nurture it so that I don't have to take medication for anything. When it hurts, I pay attention to what may be happening and I take care of it. If my back aches, yoga fixes it. If I have a headache, fresh air and a walk help. If my body aches, good food, hydration and rest bring me back to normal. If I have a fever, I meditate–it is usually an issue I am ignoring. I realize that each body is unique and that remedies work differently on different bodies. This is why paying attention to ourselves is so important. I am attuned to what my body tells me and right now my body is screaming at me. For the past two days I have had a headache, sinus pressure, sneezing, coughing, asthma, body aches, stiff muscles and a fever. I am in Lima, Perú and the stark contrast in the weather and climate conditions have hit me harshly. So I complain: the smog is intense, the mild cold temperature feels cruel with the high level of humidity, the noise in the city streets is unrelenting, there's a chilly, constant drizzle that keeps me wet. Yet, the people here are great. They say they know how I feel and that they know what to do so they invite me over to lunch at a great restaurant and they order for me. 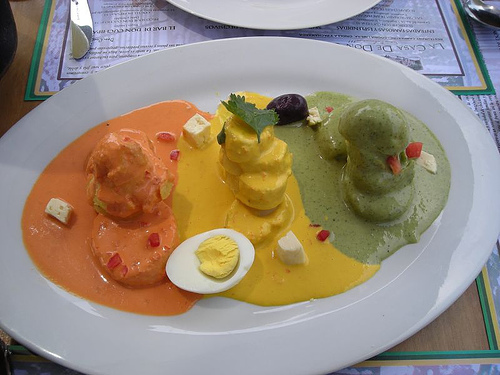 They want to treat me to the best peruvian tastes. By the end of this meal, I feel...fine. I feel more than fine, I feel happy and well. My thoughts have shifted to the friends I have made, to the opportunities opening up, the collaboration in the works, the networking, the amazing food, the incredible sights, the banter, the laughter, the music, the vibrancy in this city...the incredible gift of this experience. I am thankful. This is the first remedy. I have had to take a pill. I do it gladly. It helps take the edge off the sinus pressure. But the well-being I am enjoying is a by-product gratitude. It has made all the difference. Today I invite you to be grateful. Every time you come across a negative thought or feel like complaining about something, especially something you cannot do anything about, shift your thought to something you are glad about. The next thing you may be thankful for is not needing a new drug, yet, more importantly, the residual feeling of gratitude is enough to be thankful for and enough to change the way you feel physically.